Because of all the noise on the flight, it is hard to pick out everything being said. So I have transcribed what was said and am sending you a copy now. I hope this will help you get the maximum benefit from this DVD. The time code is included for reference. You can make a selection on your DVD player that will show the time code on the screen. (Vicki) Umm . . I went through a lot of stuff last night and this morning. you know . . . in disaster. is it OK . . . I mean, like . . . I don’t want to punch in anything . . .
I’m going to check it out here. That’s right – going to check it off and see if they did good. They were very nice, Alan, weren’t they nice? See this lady here? See this lady? So that’s it, you know . . . This is where I’m going to plan our next trip? (Linda) Do you hear that? The flaps going down? be in – when . . .
(Marguerette) But, I know that the . . .
(Linda) Did you see that? I like this – I like taxi – Isn’t this fun? (Tom, kidding) Can we go back now? (Tom) What are you smiling about? (Vicki) I feel really good. (Vicki) Talking about Korea . . .
did you watch any of the Olympics? (Linda) Now, this is it, huh? OK how fast are we going now? (Tom) Fast, OK – How fast? (Linda) Eighty – you think? (Tom) Yep – that’s good, right? (Tom) Where do you live? Did you hear it get a little quieter? (Tom) Why don’t you ask how Alan is doing? (Linda) Alan, Alan, how are you doing? (Tom) Every time you start to feel down . . .
(Linda) Why are we doing that? go in a straight line? (Tom) Because . . .
navigation stuff . . .
(Tom) What does that mean? lose it back there for a while? (Linda) I’m fine, I . . .
(Tom) So what’s fine? A “zero”? so far was going to be a “ten”. (Tom) What did I tell you? And then what do you do at the end of a movie? (Vicki) What would you like to know? (Interviewer) How do you feel? What was the takeoff like? 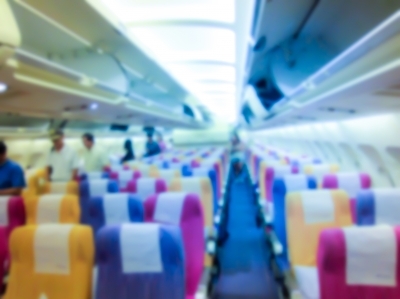 to me – I wasn’t panicky was I during takeoff? (Interviewer) You think it would be that easy? (Interviewer) How did you feel taking off? (Captain) We will be passing over Gettysburg . . .
You Jerk – why do you have to do this, you know . . .
(Interviewer) How do you feel now? (Alan) Fine, and . . . uh . . .
(Interviewer) How do you feel right now? (Linda) Very good. Am I talking to you? Am I making sense? (Interviewer) How has the flight been for you so far? get that nervous feeling back? (Georgia) OK. Where are we going next? Where’s the next good second (place to fly)? (Linda) Now, now we’ve leveled off? (Linda) Is this a lot (of turbulence) – or is this normal? You feel a little funny feeling there just a moment ago? that it’s broken and it’s not working and that’s why we’re bumping . . .
(Tom) What do you see? In a minute, you are going to hear a noise . . .
he puts his feathers out? (Linda) Why, why is this, now? (Linda) OK. Why, why are we going up and down? Yes, why are we going up and down in the air? Listen . . . are you listening? (Georgia) This is the way it’s supposed to be? (Van) From Kennedy Airport, from home . . .
(Captain) Do you feel better now? (Captain) Where are you going now? (Marguerette) Alan . . .
There’s something about it that just . . . I have to say though I was really OK.
you know, slight concern but no big deal. I mean the rest of the flight was – was fine. for someone who hasn’t flown yet? that you’ve learned that you can impart to them? Do you consider it a big success? (Interviewer) Van, what did you learn today? (Interviewer) Are you proud of it?